In 2009, Artistic Director Carolyn Christov-Bakargiev visited Guillermo Faivovich at the Städelschule in Frankfurt, and learned that he had been researching the Campo del Cielo meteorite field in the Chaco region of Argentina since 2006, with fellow artist Nicolás Goldberg. Two thousand years BC, northern Argentina was hit by a large meteorite shower, which originated from the Asteroid Belt between Mars and Jupiter. Stemming from a distant world, 4.5 billion years old – much older than the surface where they landed – these meteorites embody a stunning time-space paradox. Well-known to the indigenous communities of Argentina for thousands of years, the Campo del Cielo meteorites were later discovered also by Europeans during colonization in the 16th century. Renewed scientific interest arose in the crater field in the 1960s, followed by consecutive excavations throughout the subsequent decades, which made the Gran Chaco region into a landmark of great, if discreet importance. 1. Firstly, a book on their research about the El Taco meteorite to accompany a preliminary exhibition. Thus, dOCUMENTA (13) published the artists’ book The Campo del Cielo Meteorites – El Taco on the occasion of their exhibition at the Portikus in Frankfurt in September 2010, which involved temporarily reuniting the two halves of the divided El Taco. The 2-ton meteorite had been cut in two in the 1960s, half sent to the Smithsonian Institution and the other half eventually to the Buenos Aires planetarium. This gesture by the artists was intended as a healing process, to bring together something from the natural world that had been removed permanently from Chaco in the early 1960s with no authorization from its traditional custodians, the “pueblos originarios,” and divided for scientific purposes only. 2. Secondly, they proposed to borrow the large 37-ton El Chaco meteorite and temporarily install it during dOCUMENTA (13) in front of the Fridericianum Museum, for 100 days. Following the exhibition, the celebrated meteorite would be returned to its original location, where it had fallen over 4000 years ago when the meteorite shower first entered the earth’s atmosphere. A process therefore began to assess the possibility of the loan of El Chaco. The Artistic Director travelled to Chaco with the artists in May 2011 and met with the local institutions, government, and with some members of the Moqoit people in Las Tolderias, including a representative who was informally indicated to her as the representative of the Moqoit in the area of Gancedo where the meteorite field is located. - Suggest that there is no single centre, no “north” of the world, but that every particle and point is always simultaneously in the middle of the middle of the middle of the universe”. Throughout the debate, different and at times contrary opinions emerged, both in the region of Chaco, amongst the Moqoit, and from some members of the scientific community of anthropologists who have studied the ancient relationship between the meteorites and the traditions of the Moqoit people. Furthermore, it was clear that the shipment, if it ever were to occur, needed to be sponsored in-kind by a transport company, as it seemed unethical to spend financial resources to move a rock. In Argentina, a rich and complex debate recently arose about the loan of this object. dOCUMENTA (13) therefore put on hold its loan request on January 16 in respect of the positions stated by some experts and local communities. 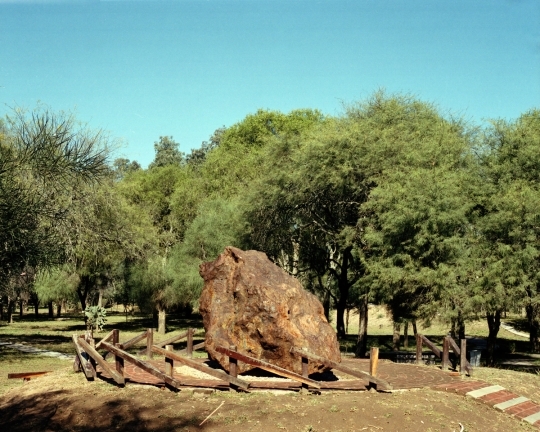 Furthermore, dOCUMENTA (13) stated that no loan of the El Chaco meteorite would be further requested without a full endorsement by the “pueblos originarios,” the traditional custodians of the land of Chaco, by the local community as a whole, and in careful consideration of the beliefs and principles of those custodians today. The artists met with concerned parties to discuss the matter together during a short trip. Consultation with the traditional custodians followed, and a Moqoit meeting was held on January 24 in agreement with local authorities to ensure that there was a broad support for the initiative. Because the artists' primary respect for a full consensus for the temporary loan of El Chaco by all the people living today in the region was not achieved at the assembly held on January 24, the artists withdrew their proposal on January 26 out of respect for those who did not agree, even though they declared that the majority of the Moqoit was in favour. Following the suspension of the loan, and in respect of the artists’ withdrawal of their proposal and of the scientific experts' positions that were brought to general attention, and after thanking the institutions and the people that supported the request and who further attempted to ensure proper consultation, and in agreement with the local authorities, on January 28 documenta declined its loan request to bring the Chaco meteorite temporarily to Kassel. What follows are moments of this debate. Subject: Letter of experts in Cultural Astronomy: move to Documenta 13, in Germany, the meteorite "El Chaco" does not respect the rights of indigenous peoples. In the past weeks has become public in Argentina a project announced by two artists from Buenos Aires, Guillermo Faivovich and Nicholas Goldberg. They have announced that they intend to move the culturally valuable meteorite "El Chaco" to Kassel, Germany, for use in the art show, Documenta 13. Chaco aborigines have voiced opposition to the moving of this meteorite. Moving the meteorite takes it out of its cultural context, deep-rooted within the landscape and the place-based history of the cultures of the Chaco. As academic researchers in the field of cultural astronomy, we strongly oppose this project, which seriously violates the rights of the aborigines of the Chaco. This action goes against Argentina's Constitution and the Convention 169 of the OIT that requires the safeguarding of aboriginal cultures and the participation of those cultural groups in discussions concerning actions that can affect them. This participation must be broad and informed and must not consist of merely a formal consultation with a representative. Since the project to move the meteorite was publicly announced, Chaco aborigines have been collaborating to make their voices heard. The current lifestyle of the Chaco Indians themselves, the writings of ancient chroniclers, and investigations brought forward in respect to the aboriginal worldview, clearly show that for these original peoples, meteorites from the dispersion of the Campo del Cielo meteor are very important landmarks within their homeland. Charged with social, historical, political and cosmological significance, these meteoric masses are seen as sources of abundance and power. In their cosmovision, the El Chaco meteorite, considered an important instrument for connecting heaven and earth, is essential for the life of men. This importance is steeped in history and remains vital and significant today. Several academic papers, brought forward over the last decade, demonstrate this relevance. The meteorite "El Chaco" has also been featured in the first film made by Chaco aborigines, The Nation Hidden in the Meteorite. This film addresses their cultural identity and their efforts to reclaim their rights. Aboriginal people have gathered around the meteorite, "El Chaco,” in protest to express their needs. For the non-aboriginal people of the region, the Campo del Cielo meteorites are also a fundamental part of their history and culture. From the early colonial period, the presence of metallic masses was one reason for colonial interests in the Chaco. That importance continued during the struggle for independence and the formation of Argentina. Campo del Cielo is a fundamental part of the identity of the province of Chaco. Depredation of meteorites is at issue in the region, and past attempts to steal the meteorite "El Chaco" have caused serious cultural damage, leaving a feeling of suspicion and insecurity. This current artistic project to move the El Chaco meteorite does not respect the cultural and social importance of this meteorite. Driven by an unsupported promise to promote "scientific tourism," it is unknown what the deciding factors of this comprise. The transfer of this cultural treasure, without the support of the indigenous peoples as central players in this project, shows a serious lack of consideration of the inhabitants of the area and a disregard for national laws. Without the peoples’ participation and comprehensive agreement, the transfer of any culturally valuable object makes no sense within a “scientific tourism” agenda. The importance of the meteorite lies not only in its weight, its make-up and its antiquity, but also in the particular characteristics of the meteor’s dispersion. The pattern formed by craters present on the ground gives the El Chaco meteorite its connection with the landscape and especially its enormous cultural, historical, and emotional impact on the society of Chaco people. When a piece of the landscape this large is removed and pulled from its natural context, it risks the entire contextual relationship between people, land, and history. Insurance that promises a monetary replacement for a cultural treasure cannot in any way compensate for possible damages, since there is no way to establish a price; it is not merely a “thing” that can be repurchased. We firmly believe that this project implies a deeply colonialist attitude, wherein the artists’ desire is to link themselves with the wealth and valuables of the Chaco. Instead of this "transfer" of the meteorite as a sort of "cosmic curiosity,” it would be preferable for those who have the money and prestige to seek to promote the value of the meteorite within its place of origin. Today we have many technological tools that would permit the artistic appreciation of this meteorite without moving it from its cultural landscape. This could simultaneously allow the people of Germany to participate in the experience of El Chaco’s cultural presence by using internet technology to become acquainted with the meteorite in its true and proper context. As an artistic, cultural, and promotional fact, this would engage more significance, more involvement with the Chaco, and a more genuinely liberating rendering. We emphatically urge all those concerned to abandon the idea of moving the "El Chaco" meteorite. Instead of continuing to reproduce colonial models of interactions, we expect those working in art and culture to set a higher standard: to lead the way for greater respect among peoples, to encourage the rejection of colonial modes of relationships, and to support full respect for cultural treasures. In the city of Villa Angela at noon on January 24 2012, an assembly starts at CIC in the presence of IDACH personalities Daniel Salteño and Antonio Mocovi, and of Ms Silvia Robles of the culture department, and of members of the Moqoit Council of las Doldeiras, and of the different communities of the Moqoit people. Silvia Robles (Culture) speaks first followed by Mr Antonio Mocovi who explains the topic of the Meteorite. Community group attending: La Tigra… Nestor Diaz. Once the assembly is opened, Mr Antonio Mocovi invites Mr Francisco Rojas del Pastoril to speak. He requests that more information about the meteorite be given to the communities. After having explained to Mr Rojas the reason of the current assembly, Mr Sixto Lalecori takes his turn and says: What benefits would there be for us if the meteorite were transported? Valerio Nicola de San Bernardo expresses his contrariness to the transportation of the meteorite. Anselmo Salteño del Pastoril supports the decision of the government to paticipate in the exhibition. Juan Carlos Martinez de San Bernardo asks about the assembly and requests to participate; after an exchange of ideas he decides to leave the room. Later, Mr Antonio Mocovi invites him to return and participate again in the assembly. Later, Mr Juan Carlos Martinez has a turn to speak and he expresses his opposition to the idea of transporting the meteorite. Oscar Villalba proposes to look for elderly people and ask them for their advice. Antonio Mocovi says that the position of each of all the people attending the assembly must be taken into consideration. Alejandro Paulino de San Bernardo does not approve the transportation. Then Ms Theresa Durnbeck explains to the attendees the government's position and proposal. The Moqoit Council unanimously expresses its support of the government's proposal. It is made clear through a specific note that the president of IDACH supports this project. Not having anything else to discuss the session ends at 16:52. In an assembly of representatives from Moqoit communities coordinated by the Instituto Provincial de Cultura (Province Institute of Culture), the presidents from the Consejo Moqoit [ Moqoit Council: a Civic Association of some Moqoit] and members of the Instituto del Aborigen Chaqueño –IDACH- (Institute for the Chaco aboriginal people) and the Movimiento del Pueblo Moqoit [Movement of Moqoit People: another Moqoit association] and a minority of elderly and young Moqoit people met. In order to address just the issue about “to move or not to move the Chaco Meteorite” to Germany to be exhibited by two artists. It is publicly known at national, provincial and Moqoit communities’ level, the benefits that can generate and/or also the negative consequences that can cause to move it from its natural place. The representatives of IDACH, whose political positions is renewed every three years, established their position with the support of some community association presidents, approving the movement of Chaco Meteorite to the exhibition in Germany. The Moqoit people have a millenary relationship with all the natural elements, all the elements which were not created or modified by the hand of man are sacred, the natural balance of the ecosystem is governed and generated by the perfect location of the natural elements, to move or modify a small or big element produces a change. With men’s power now it is possible to relocate a forest or a mountain, make a river or change the water direction; however, this must not be done. However, “Campo del Cielo” has something very special because it is a sacred place, religious scenery; it is a place where healing sessions are performed, a place where spiritual guides, hunters, visionaries, wise people and the prophets go. After the imposition of new religions in our culture, our spiritual leaders are doing these practices without making them public until today, because we feel forced to reveal to our Chaco brothers and the entire world that “Campo del Cielo” and the meteorite are our treasure as a nation. The meteorite is part of the religious scene. It is a place where we pray to the creator for a year of prosperity: in food, health, peace and wisdom. Because of this great wisdom that our culture has we invite all men from any culture to experience and share with us the wisdom of understanding who we are in this planet, where we came from and where are we going to and why we are here. We attached a proposal for intercultural projects that we presented to the governor of our Chaco Province. This proposal is based in our cultural worldview as a cultural contribution to the general society, and it is made to be included in the curricula of the formal education, the Culture Institute, the Forest Management Office and all the competent ministries. To achieve the development of our project it is necessary not to move the Chaco meteorite from its current place. Moqoit People Movement from Argentinean Chaco who signed against moving the QA 'PIGUEM LEEC (Meteorite Chaco). NO TRASLADO del QA' PIGUEM LEEC Qanaachic (thank you). • Continued participation in all the decisions that affect any of the interests or territories and ancestral heritage of Moqoit people. • Financial support for the research project and preservation for the Moqoit team of researchers, spiritual leaders and scientists. • A 30% royalty of the financial support, employment and investment from provincial government, Gancedo Municipality, tourism ministry and others who profit with the meteorite. • Recovery of the sacred place with the seven poles and ancient settlements for tourism with staff to guide. - To abolish the new law that allows moving “El Chaco” meteorite. - To legally authorize the Moqoit people as guardians in the preservation of the meteorite. - To assign a permanent fund to the Moqoit – technical team. - To include the right to a royalty on all the tourist attractions located in sacred Moqoit places. "Since time immemorial the human species has dreamed of exploring the cosmos. Close to us we have the stories of Dedalus and Icarus coming from the ancient Greeks. We have the mythologies and the day-dreaming which have carried man outside the realm of Earth. We have also read in the Bible, the Koran, and Dante's Divine Comedy, among other texts, the "travels" or ascensions of prophets and poets to outer-space, or paradise purgatory and hell... this urge for a spiritual as well as for a physical journey far from the boundaries of our planet is part of the depth of the human psyche. In the XXth century this "liberation" from Earth has been achieved materially thanks to technology. The russian cosmonaut Yuri Gagarin has been the first man, as far as we know, and as far as it has been objectively documented, to escape earth-gravity and soar into Space. In July 1969 an american astronaut, Neil Armstrong, has landed on the moon. The human species has thus started to explore physically the universe in an adventurous spirit. This conquest has shaken the psychology of mankind. Earth is no more our stable and perennial habitat. We have left Old Mother Earth. We may have abandoned it for ever. We can even explain our neglect ecologically of our planet by the fact that literally, and symbolically, we have left it behind. I believe that we can change our calendars and not mark Time by measuring it anymore according to the Christian calendar using B.C, and A.D. in our calculations. We should count the passing of our years by using either B.G. and A.G. (Before Gagarin and After Gagarin), or B.A. and A.A. (before Armstrong and After Armstrong), as a starting point. It is urgent to ask ourselves why such a radical revolution in our imagination, and in the possibilities offered for the future, has barely, or not at all, affected the artists and the philosophers of our time. This radical upheaval in our collective psyche is waiting for some forceful expression of its existence. We are presented with the possibility to bring to dOCUMENTA (13) - and for a 100 days - the meteorite El Chaco from Argentina to Kassel. What would that do for the thousands of visitors to Documenta and for the viewers that will learn about the meteorite and see its images? Documenta is not just one more art-show in the world. It is similar to an X.Ray of the moment in history that we are in the process of living. It is a way to take the pulse of our present. It is a world-event. The presence of the El-Chaco meteorite in Kassel will be of the greatest importance. It will link us first to Argentina, which has been the site for the meteorite for 4 thousand years, it will also so perfectly link us to outer-space in a dramatic way. It will remind the world that the landing of meteorites on Earth is in itself a spiritual-cosmic event. A visitation from the yet unknown. It will be Documenta's focal point in Kassel, the presence of an archangel incarnated in stone, and will repeat to us that the center of the universe is everywhere, and in this case, in a poetic way, is wherever el Chaco will stand. The "movement" of El Chaco from its present site to another point of our planet will start, or accelerate the movement of our thinking. The meteorite is a space-vessel and it may complete another traveling. The visual contemplation of it, a mystic experience, will take us back to Gagarin, Armstrong, the astronauts who came after them, and the human travelers that will follow. It will not take us back, not really, it will take us ahead, it will be an invitation for the human race to continue our destiny, it will constitute a new point of departure toward the mystery of Being." All efforts have been made to contact the copyright holders of these emails to request their online publication. Should there be any concerns from the authors of these emails, please contact vecchiarelli@documenta.de who will be happy to remove the materials.